Ex-president Goodluck Jonathan has said that under his watch as Nigeria's president, no Nigerian became a political prisoner or a prisoner of conscience based on what he or she wrote in criticising him or his administration. 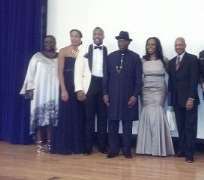 Jonathan gave the keynote speech on Saturday, 29th October at the annual Merit Awards Dinner of the Nigerian Lawyers Association of the US. The former President who urged the Diaspora lawyers to help preserve democratic institutions also said that, diversity could remain a strength only when all interest groups in the society feel safe and secured, in their day to day activities. At the event which held in New York, former Anambra state Governor, Peter Obi, who introduced ex-President Jonathan said 'nobody in Nigeria has made more sacrifices for democracy and unity in Nigeria like former President Jonathan'. Jonathan was also honored for his efforts to promote democracy by the City of New York which issued a proclamation honoring Dr. Jonathan as a democratic icon. It is a great pleasure for me to be with you in this annual gathering. I thank you for extending your invitation to me, a layman to be among learned people. I always enjoy attending programs organized by lawyers either as members of the bar or bench. Let me use this opportunity to thank the Nigerians living in the United States for your contributions to the development of our Country. When I met President Obama after our 2011 general elections, he commended the contributions of Nigerian professionals in different sectors in the United States of America. Back home, I know of your contributions to the economy of our country. Diaspora remittance is a major source of foreign exchange and the United States houses the largest Nigerian Diaspora population. Nigerian lawyers are one of the pillars of the United States legal system with many of you rising to the top of your chosen field and making Nigeria proud in the process. I salute Judge Bunmi O. Awoniyi who was appointed to the bench in California in 2012 thus becoming the first Nigerian to be so honoured in the Golden State. I also recognize Judge Jude Nkama, who became the first African to be appointed a judge in the over two (2) centuries old bar and bench of the State of New Jersey. As a body, you are an asset to Nigeria and I want you to walk tall knowing that your exploits add value to the Motherland of which you are worthy ambassadors here in the United States. Through you I see a brighter future for Nigeria. No Nation can achieve greatness without the inputs of her Learned People and that is why if there is any crop of professionals who has made Nigeria proud over the years, both at the continental and global levels, it will be you all. Your steadfastness, contributions to jurisprudence and patriotism has been pivotal to our development. I wouldn't want to bore you with so much references, but we could recollect the glorious age of our own Teslim Elias at The Hague, Obafemi Awolowo, Nnamdi Azikiwe, Gani Fawehimi and the Williams family. You will recall that Justice Udoma, a Nigerian, was the first African Chief Justice of Uganda. Let me quickly speak on the issue you've asked me to address. Obviously, the theme suggests two things. First, that there exist Diversity in our polity and second, that such Diversity could either be a Plus or a Minus for our National development depending on our conduct as a people. I will examine these existing variables from the point of view of our political orientations and institutional framework over the years. As 2014 approached, I set up a Committee to arrange for the Centenary Celebration of the amalgamation of the North and Southern Protectorates that formed our country Nigeria. When the idea of celebrating the amalgamation became known to the public, some people were against it, describing it as a wasteful enterprise. My admonition was very clear. Nigeria is great not because of the crude oil we produce but because of the size of our country, its resilient population and the diverse ecological zones. In both the people and the environment, Nigeria exhibits high diversity. The amalgamation is a blessing except we decide to make it a curse. The strength and potential of an individual is not due to his or her tribe, religion, language or ethnicity, but largely due to the brain and the application of our mental capacities. As patriots, we must strive to both explore and deploy our individual God-given talents and abilities to develop our country and build our nation. We may have our differences but these differences should serve as the mortar to cement our unity. You may have read or heard about the exchange between two of our Nation's founding fathers, Sir Ahmadu Bello and The Right Honourable, Dr. Nnamdi Azikiwe both of blessed memory. Azikwe said to Ahmadu Bello: 'let us forget our differences' to which Ahmadu Bello responded: 'no, let us understand our differences, I am a Muslim and a Northerner, you are a Christian, an Easterner… by understanding our differences, we can build unity in our country'. It is clear that both leaders had the common interest of Nigeria at heart but they were only advocating different approaches. Nigeria is a diverse Nation and sometimes I reflect on our previous National Anthem because a line in it reminds us of the need to foster unity; 'though tribe and tongue may differ, in brotherhood we stand'. We have our differences but we are all brothers and sisters. As you all know, most of my principal aides in government hailed from different ethnic nationalities. My Administration established 12 Universities, out of which 9 were cited in the Northern part of the country and 3 in the South. The same spirit guided our construction of 165 Al-Majiri schools to cater for the disadvantaged children in the North. I am proud to say that while we were conscious of the Federal Character as our constitutional guiding principle, we never placed ethno-religious interest above merit or individual values. Accordingly, diversity could remain a strength only when all interest groups in the society feel safe and secured, in their day to day activities. That is why no matter what any critic said about me, I ensured that there was both freedom of speech and freedom after the speech. Under my watch not a single Nigerian was sent to prison because of anything he or she wrote or said about me or about the Administration that I headed. Nigeria had no political prisoners under my Administration and we certainly did not have any prisoners of conscience because we ourselves ensured that we acted according to our conscience in all we did. You in the diaspora can attest to the fact that Nigeria had no political exile. Not only did I take a stance to allow people express their opinions without let or fear, we also enacted the Freedom of Information Act and by that, we tore the veil of secrecy covering governance. Nigerians deserve to know how their government functions. I am proud to say that we gave them knowledge, and that is a genie you cannot put back to the lamp. We gave institutions unlimited freedom and ensured that the Nigerian Bar Association and other professional unions, fraternities and guilds were completely devoid of any governmental influence. Finally, we enacted the Administration of Criminal Justice Act 2015, one of the most progressive criminal justice acts ever signed in Nigeria. The provisions of this Act are geared toward ensuring that the system of administration of criminal justice in Nigeria promotes efficient management of all criminal justice institutions, speedy dispensation of justice, and protection of the rights and interests of the victim of crime and the suspect. The Act, along with other institutional reforms, will help our country in fighting corruption and other crimes. I am also proud of my records as a democrat. We gave the Independent National Electoral Commission (INEC), unconditional freedom and ensured by deliberate actions that elections were free, fair and transparent. We ensured that the transition from one government to the other was peaceful. We achieved this because in constituting the Independent National Electoral Commission (INEC) we ensured that the appointments were not based on personal relationships. This gave the Commission credibility and earned the confidence of the electorate. The Chairman, Prof. Jega, whom I appointed, was a person I had never met in my life. The same sense of patriotism and profound desire to put my country's interest first influenced the critical decisions I made as President of the Federal Republic of Nigeria. The 2014 National Conference was a platform for all Nigerians, men, women, old and young, from all walks of life, and of diverse backgrounds, to have a conversation about our shared challenges, strengths and weaknesses, with the aim to strengthen our unity. It was not designed to promote the political ambition of Goodluck Ebele Jonathan. The Chairman of the Conference, Justice Kutigi, a retired Chief Justice of Nigeria (CJN) has stated publicly that I never called him or sent anyone to him to influence any of the Conference decisions or recommendations. They were to discuss everything except the sovereignty of Nigeria. My sole interest and total commitment was the unity and advancement of our country. Remember that despite their differences of opinions and philosophies, Dr. Nnamdi Azikiwe and Sir Ahmadu Bello, two fine sons of Nigeria enjoyed mutual respect and civility. I would like to see our political leaders, chairpersons of our various political parties, irrespective of their differences, get together to discuss our unity and development instead of exchanging uncomplimentary words. Some of you may recall last June, while speaking at the Bloomberg Studios in London, I called on the Executive and Legislative branches of our government to institute a Bill of Rights that would end discrimination and tribalism, and promote equality, enabling every citizen to work towards the common national goal of unity, while striving for socio economic development for all. All Nigerians should have the equal right to security, health care, education and other opportunities. That is the only way that all Nigerians can be at home in any part of Nigeria without being discriminated against in their own country. Would it not be good for all of us to aspire to a Nigeria where each of us could proudly say 'I am a citizen of Nigeria.' We would be able to look past where each of us comes from, look past our tribal origins. We would be able to evaluate each other on our merits rather than our religion or region. I argued in that presentation that, being able to declare 'Civis Nigerianus Sum' [I am a Nigerian Citizen] will mean that: You would be judged on your merits, not by your tribe or language. You would have access to education that can help you succeed on whatever path you choose. You would be part of a proud culture, one that others want to invest in. You would be safe in knowing that society judges you by your successes and failures rather than your place of origin. You would be equal before the law and your protection is enshrined in the laws of the country. You would be a valued member of your country, one who is worth investing in, who can turnaround that investment tenfold within your lifetime. Ultimately, it means that you would be an ambassador for Nigeria. Our diversity is our source of strength and bridge for the development of our tomorrow. So, let us all re-programme our thinking. Let us have no hidden agenda except the Nigerian agenda. I urge you, Nigerian lawyers in the United States and those in the Diaspora at large, to do your best to support the democratic institutions we have built. Let us pledge to Nigeria our country to be faithful, loyal and honest. Let us demonstrate responsibility in our utterances and actions. Let us honour the labour, wisdom and visions of our founding fathers. And finally, let us as patriots, in line with the conversation between Sir Ahmadu Bello and Dr. Nnamdi Azikiwe work towards building a united Nigeria where peace and justice reign. Thank you for inviting me to your esteem and august gathering. May your conference be a source of unity for our beloved Nigeria! May God bless you and bless the Federal Republic of Nigeria.